One of the most beautiful projects completed by Tillotson Construction of Omaha was their elevator with its annex in Lincoln, Neb. I was fortunate to be able to persuade my dad to stop with me to take some photos in perfect light. One of the challenges of elevator photography is picking the structure out from its sometimes tight surroundings. Usually you can take close pictures with a wide angle lens, which distorts straight lines, but can give you a full view of the elevator. In this case, I was without that tool since it broke when it fell off a chair, so I had to make do with a mid-range zoom lens. You be the judge of whether the pictures were successful, given the limitations of distance, obstructions, and points of view. 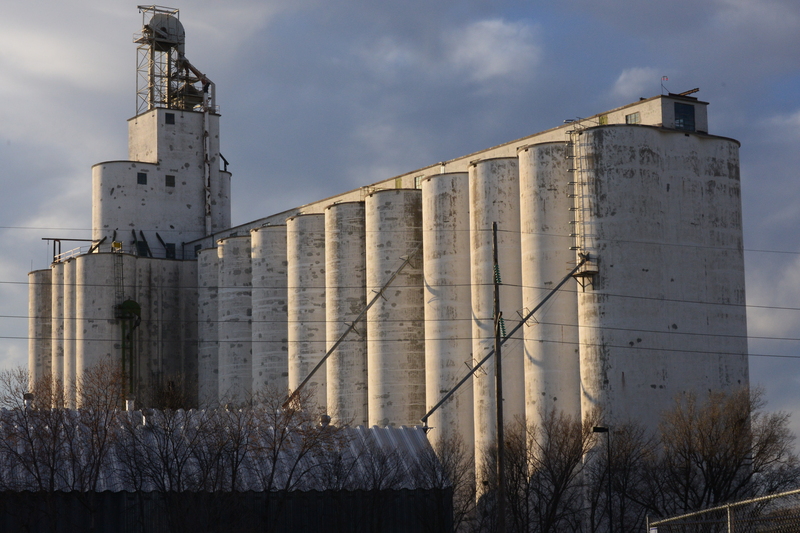 This elevator is a couple of blocks from the Cornhusker Highway in Lincoln, and one of the obstructions to a clear shot is an overpass feeding traffic to that main artery through town. The limited view required some cropping of the elevator. But the light and sky made up for the field of view. We do not know why the Lincoln elevator is not among the projects recorded in the company ledgers. It appears that at least one page was missing from the records, and there is no way to know where it is, or why it is missing. 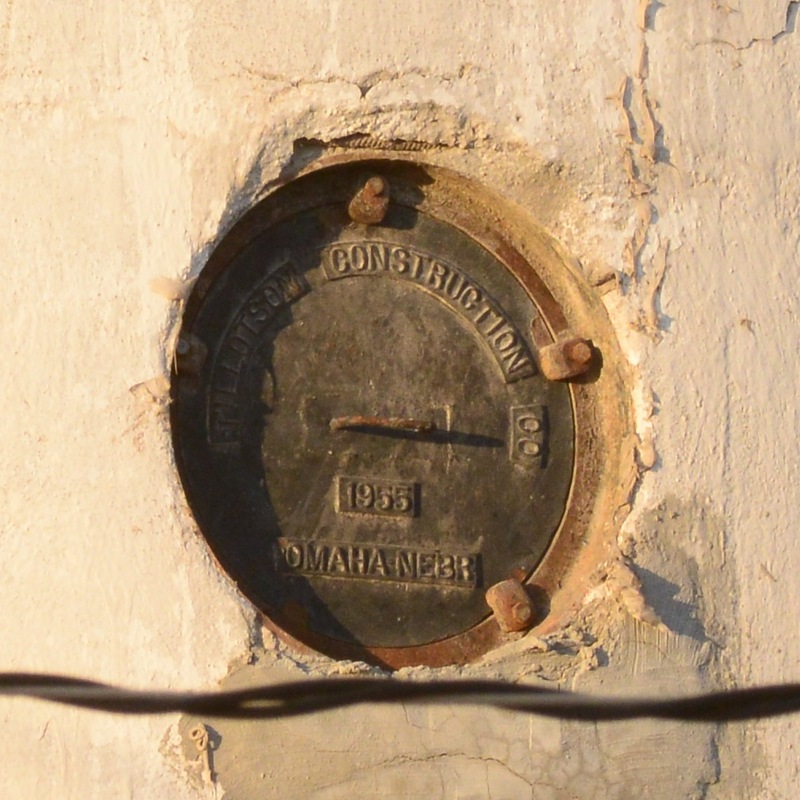 So the only information we have about its construction is from the manhole cover on the main elevator, which says 1955. Presumably, the annex was built shortly thereafter. Because the facility, AGP Grain Cooperative, was closed, we obtained no further details on this visit. This elevator will be the first on our list when the harvest time comes around again, and we can see the elevator in operation for ourselves. 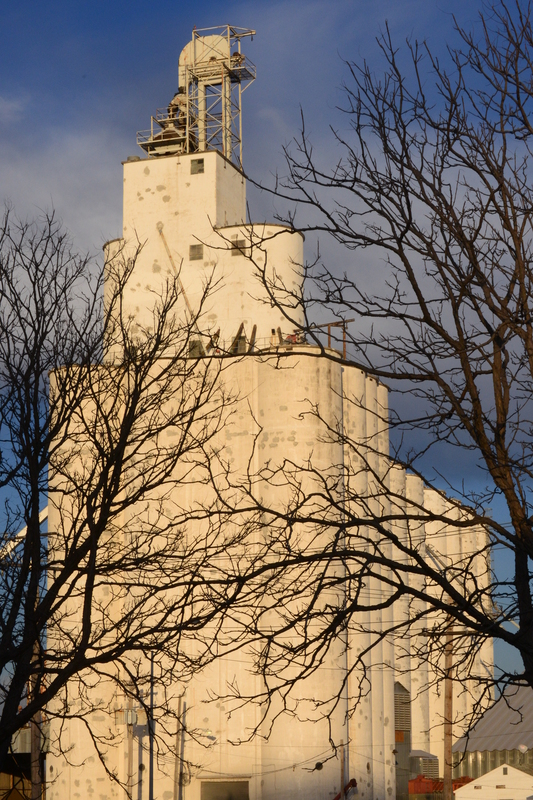 This entry was posted in Miscellany, Photography, Tillotson Construction Company and tagged construction, Cornhusker Highway, grain elevator, Lincoln Nebraska, photography, Tillotson Construction Company. My mother was born in Lincoln, NE in 1954. 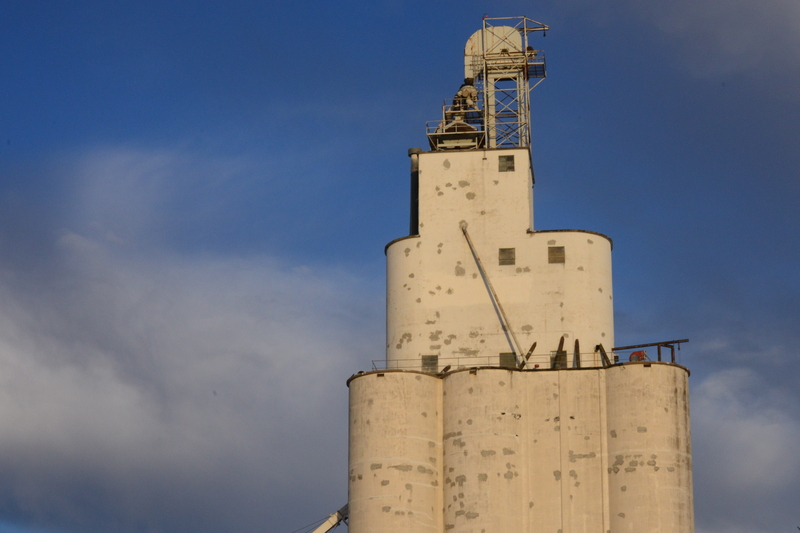 My grandfather was working for a company building concrete elevators in Manley and Murdock, NE. My grandparents were living in Murdock and my grandfather was supervising the completion of both elevators. I love reading these stories. My mom and I researched the elevators my grandfather built. It was hard because he worked for several different companies during his time building elevators. He worked for a man named Virgil Johnson out of Salina, KS the most. We used my grandparents tax returns and the town my grandfather had told my mom she lived in to do our research. It was always helpful to find those man hole covers! Anyway keep the stories coming! The Johnson, or Johnson-Sampson Company from Salina, Kan. has come up in our research many times. We think they obtained some of the elevator plans from the Mayer-Osborn Company after they went out of business, since nearly identical elevators were subsequently built by Johnson. We never found out exactly how that came about–whether Johnson hired a Mayer-Osborn designer, or if they bought the plans, and it is something we’d still like to learn. I expect you will see more about the Johnson Company in these pages. When we started the blog two years ago, we had no idea how much information we could find, or that we would still find plenty to write about two years later. Comments like yours give us more to go on, and inspire new stories. Thank you for sharing. Meyer-Osborn sounds familiar to me, but I don’t know why. As far as I can tell from looking back at the list of people my grandfather worked for, they were not one of them. He started working for Johnson-Sampson in 1948. He worked for them until 1952 when they split. Johnson and Sampson were brother in laws I think is what my grandmother told me. Later Johnson found the money to start up on his own. My grandfather worked for several different companies between and then in 1957 he was working for Johnson again. He worked for him until 1960. Then my grandfather worked for someone else until he finally settled down in a tiny IL town in 1963 and started his own concrete construction company. He didn’t ever build another elevator (As he didn’t have the capital to buy the equipment needed) but did lots of elevator repair jobs with his own company. He did start putting up gain bins too though. What was your grandfather’s name? My dad might be familiar with him, since he did some elevator work when he was in high school, and may have crossed paths with him. Darrell Greenlee. He worked for Virgil Johnson most of his carrer. when he started it was Sampson and Johnson and eventually Virgil went into business for himself. With these photos you’ve proven what so many photographers say: It’s not the equipment. It’s what you do with what you have. Your photos show off these elevators beautifully. Mike Tillotson and I worked the summer of 1955 on this elevator. He was going to be a Senior at North High in Omaha and I had just graduated. Thanks for your comment, Merle. It’s a beautiful elevator to this day. My dad Jerry Osborn also did some work on an elevator at Blencoe, Iowa during the summer of 1954. He made a dollar an hour laying rebar. He had to leave before the elevator was finished for the start of football practice. Do you happen to know when the Lincoln annex was built? Did it go up the next year?